WASHINGTON -- President Bush has been a "total failure" in everything from the economy to the war to energy policy, House Speaker Nancy Pelosi said Thursday. In an interview on CNN, the California Democrat was asked to respond to video of the president criticizing the Democratic-led Congress for heading into the final 26 days of the legislative session without having passed a single government spending bill. Pelosi shot back in unusually personal terms. White House spokeswoman Dana Perino defended Bush. "What the president said is a fact - this is the longest a Congress has gone in 20 years without passing a single spending bill, so it's clear that the speaker is feeling some frustration at their inability to do so." Pelosi's outburst was a departure. 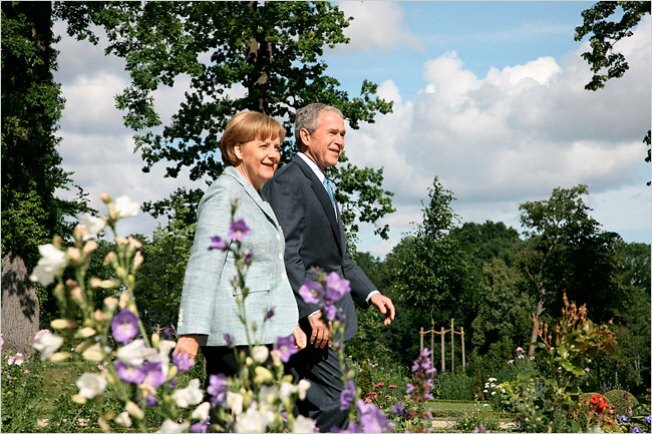 Her usual practice in public has been to call Bush's policies a failure - not his presidency or him, personally. Pelosi's remarks are the latest evidence of the Democrats' throw-caution-to-the-wind approach to Bush in the waning days of a presidency weighed down by an unpopular war and soaring gasoline prices. Election Day, after all, is just over four months away; Bush's successor takes his seat on Jan. 20. Pelosi's counterpart in the Senate, Majority Leader Harry Reid, long ago took off the rhetorical gloves. Last month, he ridiculed Republicans who sided with Bush on a Medicare bill. "Who would be afraid of him?" Reid, D-Nev., said as many senators looked on. "He's got a 29 percent approval rating." The public's view of Congress is even worse. Its approval rating has hit a new low of just 18 percent, down from 23 percent last month, according to a new AP-Ipsos poll. Bush's approval is at 28 percent, about even with the 29 percent rating last month. Only 16 percent of those surveyed thought the country was moving in the right direction, a new low as well, although statistically the same as last month's 17 percent. Last week Reid and other Democrats dropped any pretense of trying to fight the president on battles they were likely to lose - even on the most important part of their jobs, which is passing spending bills that keep the government running. Of the 12 annual appropriations bills, Congress is likely to pass one or two and send Bush a temporary spending fix for the rest. That would have to suffice until a new president takes office, Reid told reporters. Privately, Democrats have said that either candidate for president - Democrat Barack Obama or Republican John McCain - would be easier to make laws with than Bush. But Reid made clear which he'd prefer. "I would hope that before we would leave here this year that we would do a continuing resolution that would get us (through) until after Senator Obama becomes president," he said.